We will depart from tradition in this month’s Grand Traverse Journal by introducing a category of our publication soon to come: News from the Societies. As the old Grand Traverse Herald did, we will solicit news from outlying regions–Kingsley, Old Mission, Elk Rapids, and others–and print interesting tidbits here for all to see. If an organization wishes to announce coming events, ask for input from members, congratulate a member for outstanding work, or display photographs both historical and recent, the GTJ is the place to go! Many of you know the History Center of Traverse City is at a crossroads in its own history. Below, readers will find a summary of that organization’s past changes and future plans. We hope publicizing this message from the HC will clarify its present situation as well as point to its future direction. Many things continue to change as a result of on-going conversations between the City of Traverse City and History Center of Traverse City. Departing from set ways of doing things, the coming year has several promising new events and programs for the community. Below is a brief overview of the latest news, discussions with the City, recent events, and plans for future History Center operations. Maddie Lundy (previously Maddie Buteyn, Acting Executive Director), has become the Executive Director of the History Center of Traverse City. The History Center has temporarily suspended public hours to focus on internal operations and preserve resources for the future of the History Center. The two part-time staff members, Laura Wilson and Peg Siciliano, have been laid off until funding improves. The HC looks forward to the time when these positions will be restored. A new plan of “taking history to the community” instead of “making the community come to history” is being implemented. We are developing new programming, collaborating with other groups interested in our history, displaying historical artifacts in new places, and telling the stories of our past off-site, in various venues throughout the community. History Center of Traverse City and the City of Traverse City are working on a possible new lease agreement; between the History Center and the recently merged Crooked Tree Art Center Petoskey & Art Center Traverse City, to share the Carnegie building. November brought an exciting fund-raising event produced by Maddie & Laura called ‘History Mystery Theater’. This “interactive murder mystery” was well received by all who attended. Performed at the City Opera House in collaboration with the Old Town Playhouse Aged to Perfection Players, the event came to life as a realization of a dream of Maddie’s several years ago. The story was custom-written by one of the ATP Players, telling about a fictitious murder that happened around historical figures during the Victorian era in Traverse City. We had a nice turn out, everybody saying how much fun it was and that we should do it again next year. What a wonderful way to connect with the community! Traverse City Megatherium Club: This is an exciting new program that will be held once a month at a local pub. We will have open dialogue on historical topics, enjoy a local drink and make new connections. Why call it the Megatherium Club? The name is based on a group of scientists that lived and studied at the Smithsonian during the nineteenth century. By day they would discuss serious scientific topics, but by night they would let loose to enjoy a bottle of ale, a relaxed conversation, and occasional high-jinks (like having sack races through the halls of the Smithsonian!). While our shenanigans probably will not include a sack race through the Smithsonian, we do look forward to attracting and meeting some new people who share a love for all things historical and for those quirky stories associated with such. Visit our website, http://traversehistory.org/ or our Facebook to find out more. Chautauqua in Miniature: During the early decades of the twentieth century, the Chautauqua came to northern Michigan, a smorgasbord of activities that included entertainment, musical and dance performances, and talks about engaging topics. On December 15th, 7:00pm at Horizon bookstore, local historian and author Richard Fidler will inaugurate the Chautauqua program with a discussion about racial, ethnic, and religious diversity in the Grand Traverse region, describing both the set-backs and advances in our progress towards understanding the various ways of being human. Future lectures will be held on the 3rd Monday of the month at 7pm at locations to be announced. We will feature guest speakers, interactive programs and open discussions. Visit our website, http://traversehistory.org/ or our Facebook to find out more information. Festival of Trains: This annual event featuring a myriad of model trains in a festive setting to delight all ages, will open at the History Center on Saturday December 13, 2014 and run through Saturday January 3, 2015. Festival Hours: Monday-Saturday 10a-6p, Sunday 12p-4p, closed December 25 and January 1. Holiday Hours apply on December 24 & December 31: 10a-2p and on closing day, January 3: 10a-4p. Admission: $5 (4 and under free), or purchase a Family Pass for only $25 (Unlimited access to the Festival of Trains, for 2 adults and up to 3 children–exceptions with approval of History Center Staff). Please visit our Facebook page and traversehistory.org for more information. History Center of Traverse City is a nonprofit organization who owns a collection of over 30,000 photographic/paper records related to local history. We are the keepers of our past and ask for support in sharing and preserving this community’s rich history and culture! To become a member or donate please visit our website; traversehistory.org, email us at museum@traversehistory.org, or call 231-995-0313 ext. 106.
by Eileen (Brautigam) Reamer, with editing assistance from Pete and Connie Newell of Kingsley, known for their personal story writing workshops. Author Eileen Reamer, in a 2012 photograph. Image courtesy of Pete and Connie Newell. 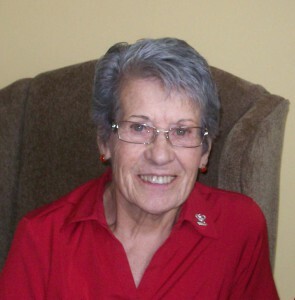 Eileen is the daughter of Fred and Neva Brautigam. She resides in Kingsley, Grand Traverse County. She and her siblings were raised in the village proper during the 1930s. I’ve always wondered how my father’s family all ended up in Jackson when they were all born in Kingsley, but I do know that my father was nine years old when his mother died leaving eight children and it’s one of those questions you wish you knew the answer to and there is no one left to ask. After the passing of his mother, my father lived for a year with Bob DeFrance and his wife in the Kingsley Hotel which is almost in my present back yard at 203 Fenton St. in Kingsley. It is on the point where Brownson and Spring Streets come together. My dad said he planted asparagus in their garden which is just behind my garden now, and to this day some of the asparagus still comes up in the spring, so it’s like having a part of my dad around. Mom was born in Mt Victory, Ohio on May 26, 1901. She met Dad in a Baptist church in Jackson, Michigan and they married on March 30, 1921, then moved to the village of Lake Ann, Michigan where my brother David, Sister Virginia and I were born. Because they lived in a rural part of Lake Ann, Mother held David back until it was time for Virginia to start school so he wouldn’t have to walk the mile and a half alone. We lived across the road from the Bill Morse family, so Esther and Mom were such good friends. Esther didn’t have a mean bone in her body, and she spent much of her life playing the piano at nursing homes along with her son, Bill Jr., who played an instrument too. Even in old age she would kid about going and playing for the “old folk”. When it was time for me to enter the world the doctor was nowhere to be found so Esther delivered me, and she always referred to me as her baby. The Morse’s were a wonderful family and we have remained friends to this day. In the five year span between Virginia and me, Mother delivered a stillborn girl. Since she was born in March and Dad’s name was Fred, she was named Winifred. It wasn’t until 2009 while visiting Virginia in Florida that we got to wondering where she is buried. It seems so odd that we never questioned it while there was someone still around to ask. 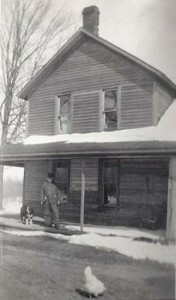 Peter Brautigam, at his home on Sparling Road in Kingsley, undated. Image courtesy of the author. When I was just a baby we moved to Kingsley and lived with my Grandpa, Peter Brautigam, on his farm on Sparling Road east of Blackman road, and the undated house is still there. My mother never liked my grandfather because he was a boozer and when he had company he made her take us children into the parlor and keep us quiet. He always favored me and was constantly disciplining David and Virginia; He would reach across the table and crack them across the knuckles with his table knife if he didn’t like what they were doing. Marian was born on the farm and we moved into town shortly after that to a house on Fenton Street next door to the house that would later be the home I grew up in. When Dad bought the house it was barely a skeleton. It was one of what everyone called “Parker’s old tin houses.” They were sided with tin shingles as one can see from looking at the picture of what the house once looked like. You can see them on the top half of the house, but more on that house later. My memories of the first house on Fenton Street, even though I was under five, are sparse but clear in my head. We four kids slept upstairs in one big bedroom with two beds. I slept with David, a sleepwalker, who took the blankets with him wherever he went. He was famous for sleeping at the bottom of the stairs, and we used to get dressed behind a wood stove in the living room. One of my memories of Marian at time was her sitting in a high chair asking for a donut. Mother told her if she took it she had to eat it. Well, she wouldn’t eat the donut so Mom sat her in the wood shed off the kitchen until she did. Marian was a problem from then on, it seems. She didn’t get along with other kids very well and the only one of us kids I remember who ever got a spanking. Charlie Snyder lived in the big house next to the hotel and had a barn on Spring Street which is still there. He had cherry orchards and horses, and one day the horses got loose and ran down Fenton Street and into our driveway which is butted up to our house. Marian just happened to be in the driveway at that time and they knocked her down and scared the daylights out of all of us but fortunately she didn’t get hurt. It’s something you don’t forget! 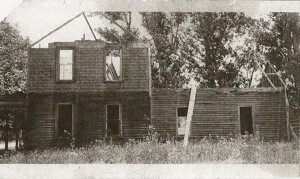 One of “Parker’s old tin houses,” the shell of the Brautigam family home, mid-construction, where Eileen was raised on the corner of Fenton and George Streets in the village of Kingsley. Image courtesy of the author. Dad was a carpenter so he was able to restore the house next door. One of the first things he did was to close the open stairway. He always maintained too much heat was lost going up open stairs. The house had two very large bedrooms upstairs and we had two beds each in them. There were three small bedrooms on the main floor and he turned one into a bathroom eventually. He also took the partition out between the other two bedrooms making it one large one. We moved into this house when I was five which is where Beverly was born when I was eleven and that completed our family of one boy and four girls. The night Beverly was born, we kids were herded away to some friend’s home to await her arrival. We were a happy family and I have good memories, but one not so happy memory comes to mind as I think of the time we were going to Jackson to Grandma Alwine’s for Thanksgiving. In those days it was an all day trip. The morning we were to leave there was car trouble. What a disappointment that was. Bologna for dinner! I loved my Grandma Alwine so much. I remember the time when I was a young grade school student, we were visiting Grandma and when it came time to go home I wanted to stay. I made such a fuss that my parents decided to play a game with me. They supposedly left thinking I would change my mind when they drove away. I was a happy camper and it was with much distress when they drove around the block and came back for me. 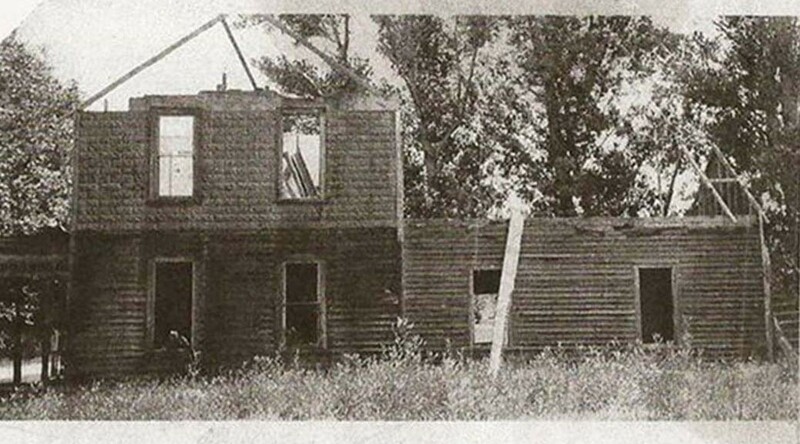 My grandparents later retired to the North and bought a house on Wexford Corners one mile East of M-37 near Buckley. It was a happy time having them so close, but it had a sad ending. Grandpa went to the basement to look for a gas leak and suddenly there was an explosion, and the living room floor fell right into the basement, plus it blew out the sides of the house. The paper stated that Grandpa lit a match to look for the leak but we know that is not true as he was always so cautious that way. He may have lit his pipe without thinking, but we will never know. He was rushed to the hospital with his hands hanging out the window as the skin was burned off from them. I don’t even know who drove him as it was before we arrived. Unfortunately his lungs were burned also, and he died two days later. Grandma was never the same after that, so she moved back to Jackson to live with her daughter. Grandpa was 81 when he died and Grandma lived to 87. There is so much more I could write but that will be another story. 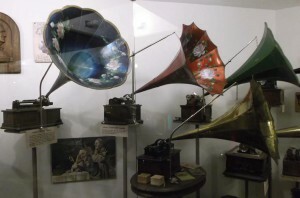 Acoustic phonographs on display at Music House Museum, October 2014. Acoustic phonographs and electrically amplified jukeboxes face each other from across the walkway of the Museum gallery, not unlike an alley scene straight out of “West Side Story”. If they had fingers, they would be snapping them menacingly in time with the beat projecting out of their horns and speakers, respectively. The heightened drama of this standoff, one audio technology superseded by another, shouldn’t be lost to visitors of the Music House Museum in Williamsburg, Michigan. Although the display is fantastic, it is hardly the most impressive sight to be seen and heard. The Music House, a 30 plus year old non-profit museum, is home to one of the larger publicly accessible automated musical instrument collections in the United States, and it is sitting in your backyard. “Automated”, meaning that they are instruments that literally play themselves! Visitors are welcome to explore the vast collection of music reproduction technology found within the 1910 dairy barn and gallery that comprises the public space of the Music House Museum located on the remaining 7 acres of the Stiffler Family farm. 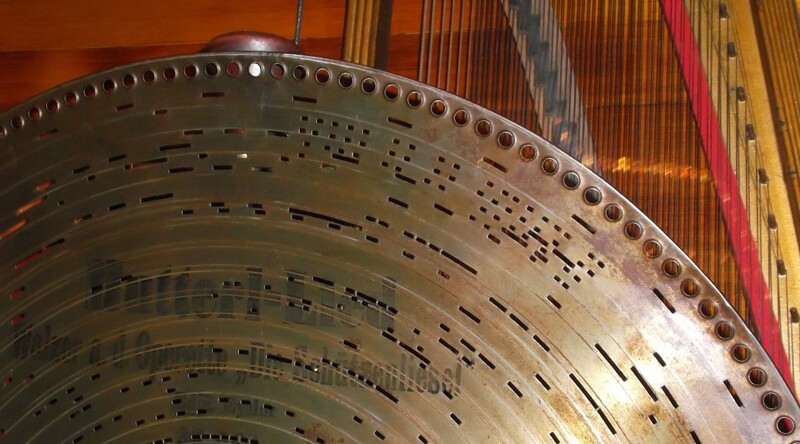 In addition to the instruments already named, you’ll find examples of early radios, 200 year old barrel organs and Turkish and Spanish barrel pianos, American reed pump organs, two pipe organs, European fairground and dance organs, a Bavarian organ clock, Milton and Duo Art player and reproducing pianos, several example cylinder and disc music boxes, a rare Lochmann Original 450 disc piano, European and American nickelodeons, and other examples of instruments “featuring mechanical music reproduction some of which predate electricity, Bruce Ahlich, Board Vice-President and Collections Committee Chairman states that “an important aspect of the Music House Museum, unlike some similar venues, is that if the instrument was not originally electronically amplified or powered, it normally remains so in our collections”. 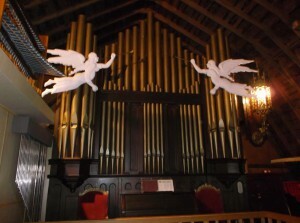 Estey pipe organ acquired in 1988 from St. Andrew’s in Saginaw. Not only does Ahlich and his Committee oversee collections maintenance and acquisition of new items, he is also an accomplished local organist who played the dedication recital on the Estey pipe organ acquired in 1988 from St. Andrew’s Roman Catholic church in Saginaw, now located on the raised deck at the Museum and used to demonstrate a Wagnerin organ roll player. Much of the maintenance and minor restorations of the Museum’s collection of unique instruments takes place on-site in its Workshop. Larger projects are usually contracted out to outside specialists who engage in that particular type of work. “Our goal is always to seek to restore the instrument as close as possible, given available materials, to its original condition, which can be a time consuming and expensive proposition”, further states Ahlich. “Electronic sound reproduction can never replace the experience of an acoustic instrument being played”. “We could put CD players with hidden amplifiers in the instruments at a lot less expense, but what kind of Museum would we be and what type of musical experience would our guests have”? The Music House Museum prides itself in having a majority of the displayed instruments playable with the major instruments demonstrated on every tour to its patrons. Not ready for inspection! 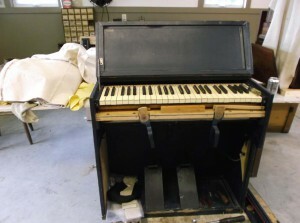 Military chaplain’s portable reed organ, World War II-era; Currently undergoing restoration in the Workshop. Local restoration and repair of instruments is done in a workshop off to the side of the main building by hired and volunteer staff. Among projects underway is work on the Museum’s Seeburg KT nickelodeon and restoration of an Estey chaplain’s portable reed organ probably used in World War II. The Workshop also stores other automated instruments waiting for funding to be restored. The workshop construction was paid for by a Rotary Charities grant in the mid-90s, and the volunteers remain grateful for that and other bequests to the Museum. Without this kind of assistance, and funding from individual donors, the Music House could not be what it is, a truly unique museum of musical craftsmanship dedicated to the preservation and education about a type of music that lifts the soul and gives a window to the listener to the past. Earnings for a Museum instrument purchase/repair endowment fund assist with restorations, but often do not cover their full costs. 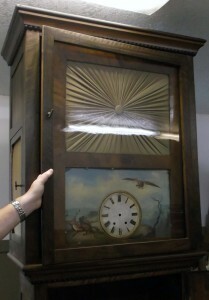 Rare 1830s Bavarian Black Forest clock, currently undergoing restoration in the Workshop. 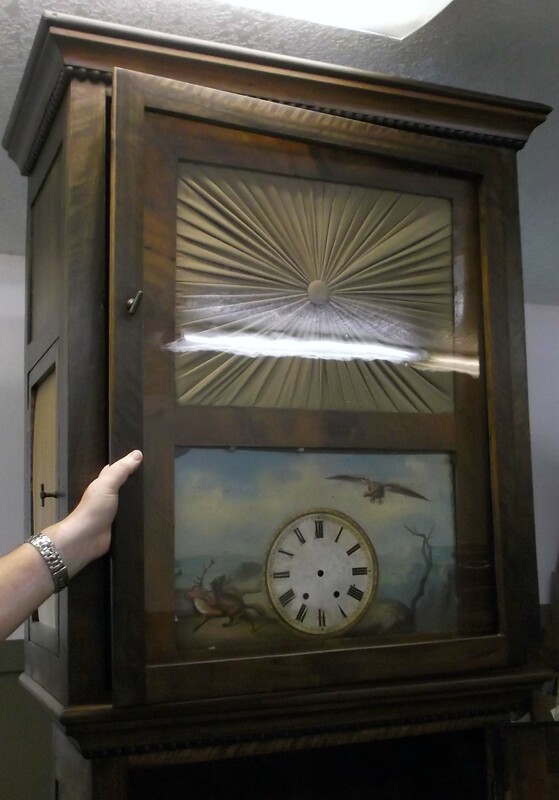 A fun piece currently being restored is a scarce Bavarian Black Forest floor cabinet organ clock, not yet ready for display that dates from the 1830s. The principle challenge in this restoration project has been finding a suitable clock mechanism as the original had been long removed before it was received by the Museum. The piece has stood silent for several decades on display in the Museum galleries. An English clock mechanism has been found and will be installed by local and nationally known clock artisan, Nathan Bower, together with a new clock face this winter. When reassembled, the clock will chime the hour and then trigger a small two-rank barrel pipe organ to play. Ahlich states, “we are really looking forward to have this piece greet our visitors in the lobby when we reopen in for the 2015 season in May.” This project will cost approximately $2,500 to complete. While the restored clock will be impressive, the original assembly was equally remarkable, as Bruce describes: “In slow winter months, a village collective would develop between neighbors in the Bavarian region of modern Germany, and a cottage industry creating these intricate clocks was born. Each farmer or craftsman would work on his part; some would be responsible for the wood cabinet, others would build the clock, others craft the face and others build the organ and its mechanism, and finally a last person would assemble the whole clock together.” We might pride ourselves on being a do-it-yourself culture, but I’d say those Bavarian artisans have us beat without the benefit of electricity or computers. 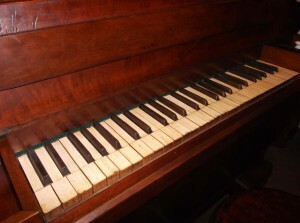 A 1904 Lochmann Original 450 disc piano. 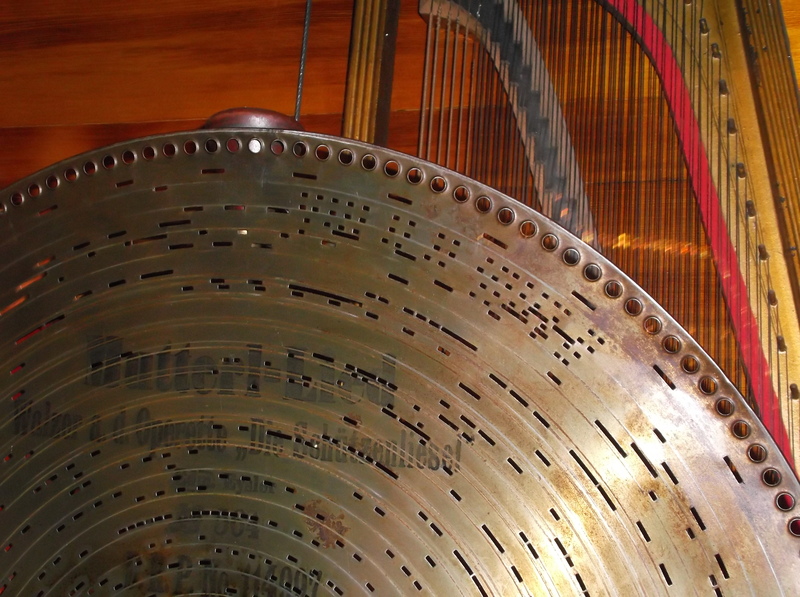 The perforated disc pictured here, along with other mechanisms, plays the piano strings seen behind the disc. That doesn’t mean we can’t appreciate beautiful craftsmanship when we see it! Take the Lochmann Original 450 disc piano from 1904 on display in the Hurry Back Saloon, a section of the barn restored to appear as an old-timey watering hole and general store. This piece, among the rarest in the Museum’s collections, represents an innovative step in automated instruments and a natural evolution of the disc music box. Before, craftsmen would (expensively) create music boxes by inserting hundreds of pins individually on to metal cylinders; The pins would pluck pitched combs as the cylinder rotated, and the box would play the inscribed melody. The disc music box uses stamped steel discs to achieve the same effect at a much reduced price tag. The Lochmann Originals takes the next step by moving the technology to play a 44 note piano and 12 note chime mechanism. These instruments were built for a relatively short period of time (less than a decade) and as such are scarce and rare to find in playing condition. They, together with other disc instruments, were replaced by the player piano and the developing phonograph by 1908-10. Also silent for many years, the Lochmann is now tuned and playing. Bruce played a waltz for us using one of the original discs, to show how the hand cranked 150 lb. stone in the back of the cabinet powered the disc movement to create the music. Worth the 10 Pfennings this coin-operated machine would have cost you? You bet! An admirable, if amateur, attempt to build an organ, ca. 1844. Pictured here are the cow-bone keys of that organ… notice anything missing? Not every piece in the Music House is a miracle of invention. Acquired by the Music House in the 1990s, stored for over a decade on the top shelves in the Workshop and finally rediscovered and reassembled and largely restored in the fall of 2013, the cabinet organ pictured here is a fantastic amateur effort to build a home pipe organ. How amateur? Well, the maker forgot to build a place to rest music on. In addition to that revelation, Museum restorer (Jim Gruber) determined that whoever built the organ was likely a skilled European cabinet maker living in the Southern United States about the time of the Civil War. How did he get all that information from boxes of disassembled parts and cabinetry? The type of wood used to build the cabinet was grown in the South, tulip poplar and gumwood; the keys are made from cow bone, which also places its manufacture in the United States; the maker was not a professional organ builder, as scrap wood and leather was used throughout and the interior shows many efforts at reworking the placement of the organ in the cabinet. Pages from an old atlas were used to seal the bottom of the wind chest; the paper in question was taken from an atlas (Olney’s School Geography and Atlas), and have been dated to circa 1844 by the edition numbers found on them. Finally, the maker was likely European, as the notes inscribed on the pipes for their pitches and the cabinet measurements all fit European standards. Restorers and sleuths, the volunteers at the Music House display a variety of talents. 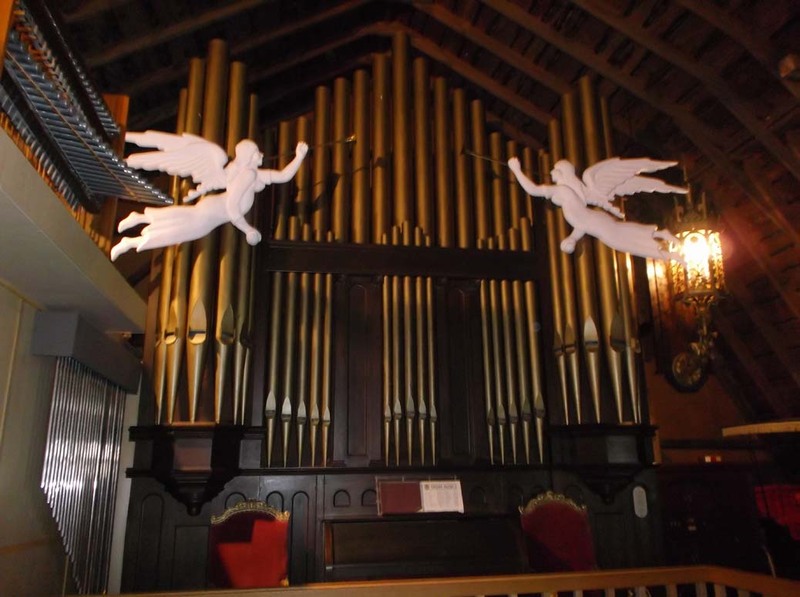 Grand Traverse Journal will feature the Music House again in the spring, when the 1913 Bruder Fair Organ “Columbia” will be back from Ohio, where it is currently undergoing a $12,000 professional restoration that could not be done in-house. A generous $5,000 matching gift, some Endowment monies and private donations have enabled to Museum to fund the project, as well as acquire some new music book stock by which to play it. Hurry, the Music House Museum closes January through April, so enjoy the sounds of the season any weekend in December! Decorated for the Christmas season, as docent Becky Gagnon says, “There is a magical feeling every time you walk in!” The Museum is also open the week between Christmas and New Years from 10 am to 4 pm with continuous docent led tours. A community open house with refreshments and reduced admission ticket prices is planned for Sunday December 21st 12 noon to 4 pm, where all of the instruments will be demonstrated on a rotating basis playing Christmas music if it is available for them. Amy Barritt is co-editor of Grand Traverse Journal. This article could not have happened without the generosity of Bruce Ahlich of the Music House Museum. Thanks Bruce! 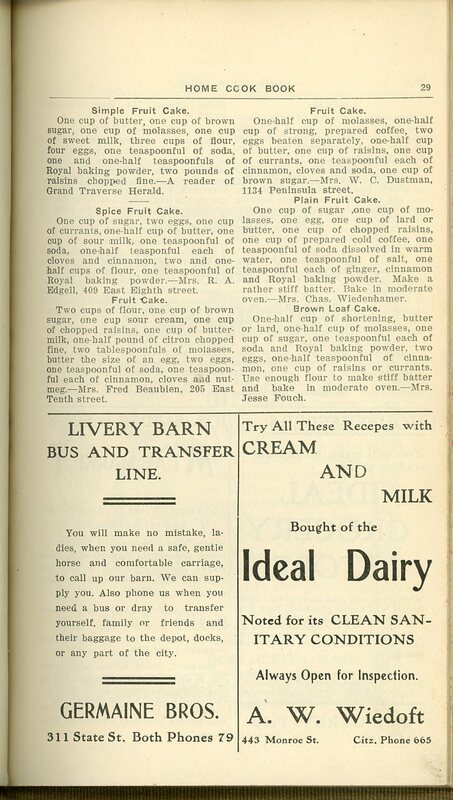 What were women baking in 1905 Traverse City? Traditions are comforting reminders that we have a shared past with those around us. Perhaps the favored traditions during the holiday season revolve around food: cooking the recipes of our grandmothers, gathering to eat at the tables of our forefathers. 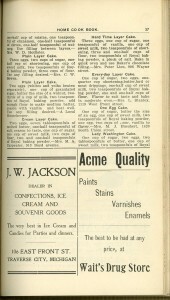 Page 28 features a number of chocolate cakes, perfect for the cocoa-loving family member. Your editors located this serendipitous find in the Nelson Room collections at Traverse Area District Library, and thought you might enjoy perusing the recipes and advertisements within: The Home Cook Book, a collection of recipes, mostly baked goods, collected from women all around Traverse City at the turn of the last century. The compiler of this book presents it with the confidence that brings to the housewives of Traverse City the most modern and strictly up-to-date recipes obtainable. Reclaim fruitcake from stories of holiday terror by making a fresh loaf yourself, using one of the recipes found on page 29. 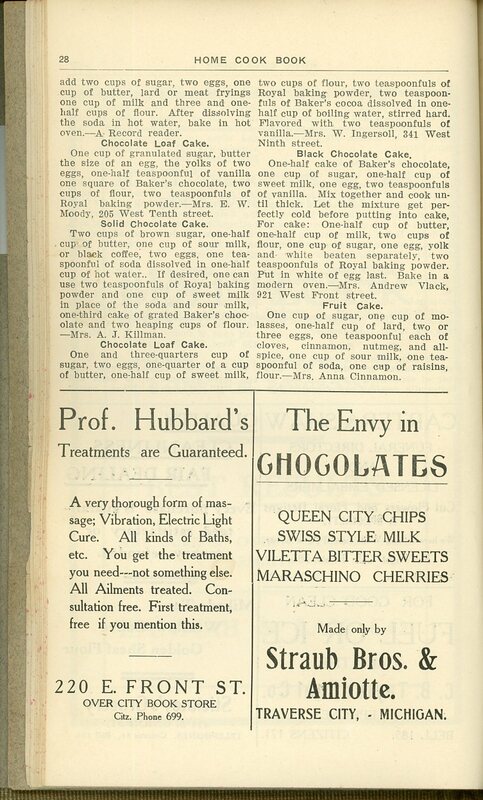 The recipes contained herein were contributed by the local housekeepers and have been tried and tested. To those who so kindly loaned their assistance in this way, the complier is deeply grateful and trusts that the book may in some measure compensate for the time and effort expended. 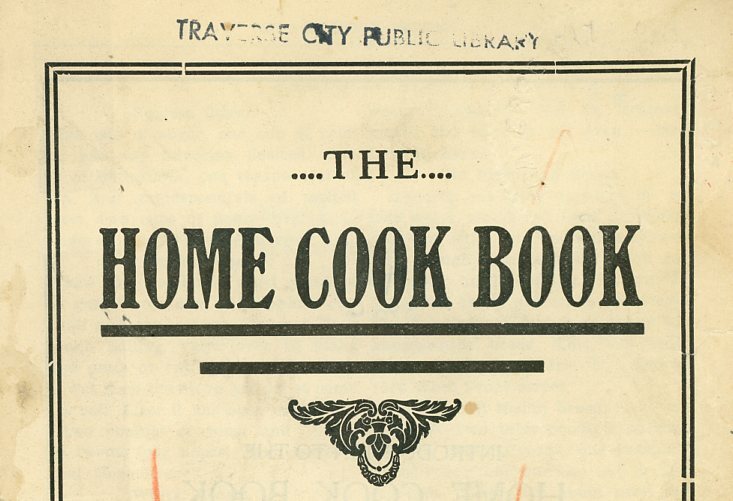 The Home Cook Book was compiled by Lewis W. Smith, Circulator for the Evening Record, “with recipes carefully arranged and classified by” Mrs. Lewis W. Smith and others. 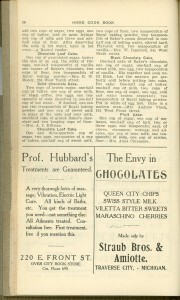 Although the cook book is undated, the Evening Record circulated between 1901 to 1910, so it was likely printed during that decade. 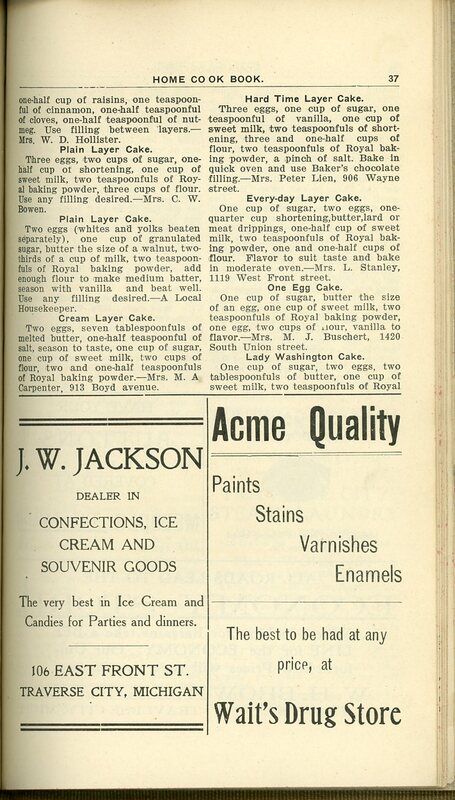 For the ambitious, layered caked recipes. Imagine baking one of these in a wood-heated oven…from page 37. 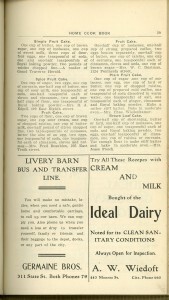 With sixty pages of recipes, all “the most modern and strictly up-to-date” from over 100 years ago, there’s bound to be a new treat for you and your family to try. The best way to keep alive traditions, and therefore history, is to use and pass them along to the next generation. If you feel inspired, you can click on a page to enlarge it, read and test a recipe out, and send in your results to the Grand Traverse Journal (gtjeditor@tadl.org)! We will be pleased to publish your photographs and descriptions in our January issue. Bake on! In winter the animal world goes to sleep—or, at least becomes less apparent to us. In particular, the world of small living things disappears, the world of insects, millipedes, centipedes—and spiders. We are of like mind. I am hardly an expert in spiders: I encounter them separately as each enters my consciousness—by chance, not searching them out. Some, like the funnel-web weaver can be identified by the shape of its web, a sheet of silk that tapers to a narrow opening where its inhabitant lives. The orb weaver makes a gorgeous web with spokes and concentric circles. I love the name of one of them, Argiope aurantia, a name that comes from one of the Greek naiads or water spirits. She—and the inhabitants of webs are female—weaves a gorgeous structure out of the finest silk to capture whatever small thing blunders its way into the sticky strands, a story both horrifying and fascinating. I confess as a child tearing of a leg of a grasshopper and feeding the twitching body to a yellow-bodied Argiope aurantia, poised in her web to bite and wrap up her prey. Far from signaling the beginnings of major psychosis, it was just a small child’s introduction to life-and-death, an encounter that stays with me still. Wolf spiders terrify us with their size—with legs extended they barely fit in a teacup—their furry bodies, and their speed as they flee from us or go after prey. Similar to them are fishing spiders, one of which, the Dark Fishing Spider is the largest spider in North America, its body more than an inch long. It journeys far from water, often winding up in cabins and homes near the water. It feeds upon full grown crickets and small children (just joking). A naturalist friend of mine recently emailed me an image of one she caught in her home close to West Grand Traverse Bay. With compassion, she merely let it go outside her home rather than crushing it with her heel. Then there are the jumping spiders, nervous creatures with two great eyes in the front of its head, looking more like us that all the others. They build no webs at all, preferring to wander about in search of prey, dragging a silk thread behind them. With so much to say about them, they deserve a separate article in the Grand Traverse Journal. Cellar spider with prey. Image courtesy of Tom Blackwell through a Creative Commons license on Flickr. Finally, there are the cellar spiders, the most common ones we see around the house. 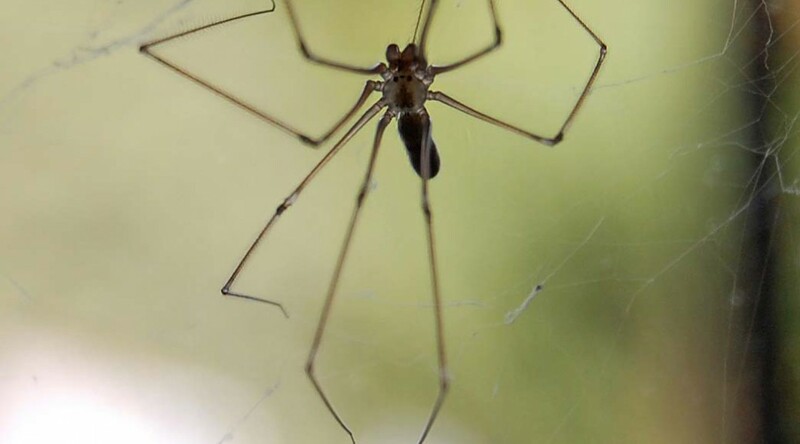 With long legs and narrow bodies, they are sometimes erroneously called “daddy long legs spiders”, a term that signifies the harvestmen, not a spider at all. They hang upside down in its poorly crafted web, a “cobweb” waiting for prey. My favorite spider book, Spiders of the North Woods, tells me that when disturbed, they may shake their bodies, making them appear as a blur. I will have to test that out. Are spiders dangerous? Not for the most part. The Black Widow does have a poisonous bite and I have seen them around here. A bite would sicken the victim but not kill him/her. 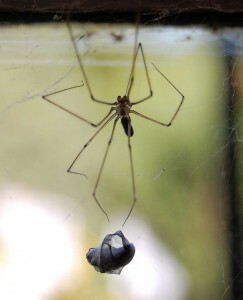 Other spiders hurt if they bite, but most of them cannot even penetrate the skin. Many wounds attributed to spiders were caused by other vermin, fleas, ticks, or insects. We need to show them respect, especially in the winter when we see few wild living things close to the house. Maybe we can let the cellar spiders live out the cold months—at least as long as they stay in the cellar. Richard Fidler is co-editor of Grand Traverse Journal. Tied to a desk in the near past solved! Not all history is ancient. In the early adoption of the world wide web by the masses, internet cafes and cyberstations, like the one pictured here, were popular places to flock for a quick coffee and email check. Now that we’re no longer tied to desks and hardwired internet connections, these locations are now relics of the past, even though “the past” was only 15 years ago. 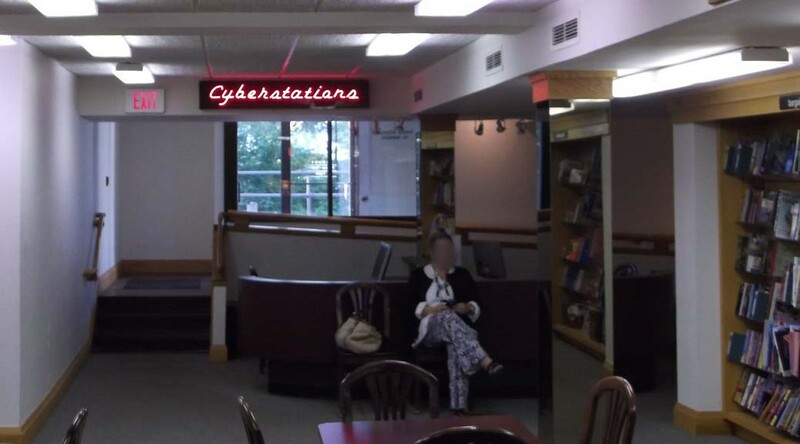 Do you recall where this “cyberstation” is? Please feel free to share a fond memory as well! Ed. Note: The following is adapted from the “Images & Recollections from Port Oneida” series of books produced by Tom Van Zoeren in partnership with the Friends of Sleeping Bear Dunes. The books are based on oral histories and photos collected from natives of the farming community, which is now preserved as a Rural Historic District within Sleeping Bear Dunes National Lakeshore. The books are available at area bookstores and through VZOralHistory.com. The early beginnings of the Werner family in America are now misty—but around 1854 Frederick and Margretha Werner left their crowded, oppressive homeland of Hanover (now a part of Germany) and sailed to the New World with several small children. Arriving in New York, the Werners purchased 202 acres of Port Oneida land, sight-unseen, for 75 cents/acre. They then sailed up the Great Lakes to South Manitou Island to spend the winter. In the spring the young family crossed the Manitou Passage, climbed the steep shoreline bluff, and surveyed their piece of primeval forest. The land was rolling, and included a hilltop that looked over the surrounding lands and waters; but it also included some level ground that promised good crops. 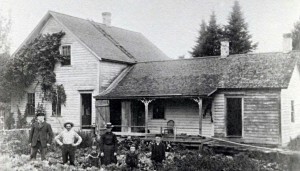 The Werners began the task of establishing a home in the wilderness, a half-mile down the coast from the only other white settlers in the area, Margretha’s brother Carsten Burfiend and his family. Frederick built a small log cabin in a sheltered spot near the bluff above the lake. He then began clearing the virgin forest for a farm. The details of their lives can only be imagined; but it’s told that the family lost three children to pneumonia during the first years in Port Oneida. During following years Margretha bore more children to total 14. Five did not survive childhood, and rest in the family graveyard overlooking the lake. Of course, a wilderness pioneer has little means for precisely determining property lines, and after 15 years building a farmstead, the Werners were informed by their neighbor to the north, Thomas Kelderhouse, that their home was on the wrong side of the line. 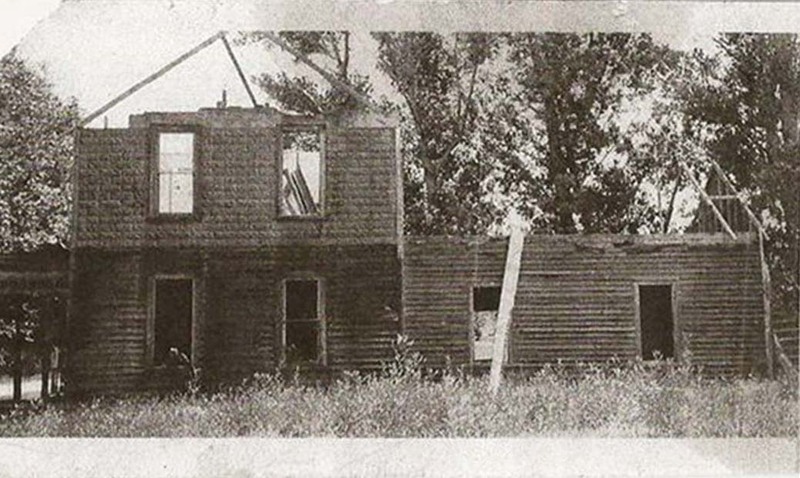 The Werners had to disassemble their hard-built home and farm, and relocate 1/4 mile southwest to the location seen here. 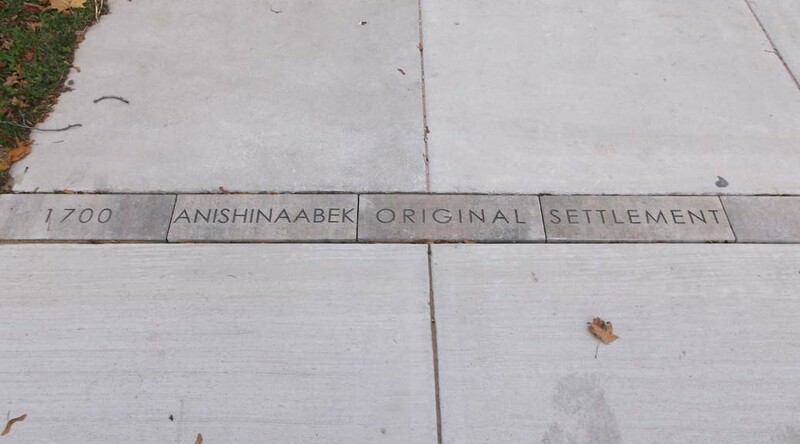 There are no foundation remains left to mark the original home site. Great-grandson Charlie Miller believes it was constructed on a base of logs. By the time of this earliest family photo, a half-century after arriving in Port Oneida, the Werners’ daughter Margaret had married, and her husband, John Miller, had taken over farm operations. Here they pose in front of their home; L-R, they are pioneer Frederick Werner; his son-in-law John Miller; daughter (Mr. Miller’s wife) Margaret; the Millers’ daughter Annie; their son Charlie; and John Miller’s son by a previous marriage, John. Pioneer Margretha had died five years earlier. The original log cabin on this site was eventually added onto and covered with clapboard siding, but remained within the walls of the one-story portion of the house seen here. The old house is gone now, but Charlie believes that the tree just peeking above the roof to the left of the larger spruces is the huge cedar that can still be seen south of the end of Miller Road, along the way to the old barn. Van Zoeren is a retired Sleeping Bear Dunes Park Ranger, who now works to preserve Port Oneida history. All of the oral history interviews, their transcripts, and related photos that have been collected have been donated to the public domain and are available in digital form at the Glen Lake Library (Empire) or from Tom. He welcomes your questions, comments, and further Port Oneida information (via email at VZOralHistory.com). You can find this piece of history better in the spring than now… or with the use of a snow shovel! Where and when was this memorial installed? Do you remember the controversy surrounding this particular section?